Your “choose your own adventure”-style story in this month’s issue is such a fun read. Which came first, the structure or the premise? A couple years ago, I tried getting allergy shots to treat my seasonal allergies (for many people, this is really effective, but it ended up not working for me). With allergy shots, you go to the clinic on a regular basis (e.g. weekly) and get an injection with a small amount of whatever it is you’re allergic to. Gradually, over time, they increase the amount of allergen in your shot. Because they’re injecting you with a substance you’re allergic to, you’re required to stay in the clinic for thirty minutes after your shot. Therefore, I spent a huge amount of time sitting in the waiting room of a busy medical clinic, often with a giant itchy welt at the injection site on my arm. One day while I was sitting through the required thirty minutes after my shot, I wrote a few paragraphs about a medical clinic on a space station, but it didn’t really go anywhere. It wasn’t until a month later that I figured out the story should be a CYOA, at which point it pretty much wrote itself. I love the wink-and-nod relationship you have with your reader throughout the story, starting with the artificial gravity “that defies the laws of physics and yet is surprisingly common in fictional space stations.” Much of science fiction is built on similarly impossible tropes—how do you engage with them, or deliberately avoid them? I love tropes as a starting point for stories—you can twist them, subvert them, play them for laughs. I poke fun at artificial gravity in this story, but I can see why it’s so common. It’s easier and cheaper to make a movie where the space station has artificial gravity. In short stories, you have to choose what you want to spend your words on. Science fiction often has a lot of weird stuff going on, and, depending on the story, it might make sense to have characters walk around in normal gravity on the space station so that the reader can focus on the alien parasites that are eating the circuitry, or the budding relationship between the captain and the station AI, or whatever it is that the story is really all about. That said, I do think stories are usually more interesting when they go beyond the standard SF tropes. I love to read stories with truly bizarre aliens, or futuristic technology that is integrated into the world of the story. Artificial gravity, for instance, would be pretty cool if it was used for something beyond just letting people walk around in space stations. Congratulations on your recent inclusion on the longlist for the British Science Fiction Award! You’ve been previously nominated for the Nebula award, among other accolades—are the stories of yours that the public appreciates most also your favorites? How do you assess your own work vs. the work of others, and do you think the experience of creating a work (whether the experience was good or bad) colors how you see it after publication? Thank you! It was so cool to see one of my stories on the BSFA longlist alongside stories by a bunch of authors I really admire. I’m an absolutely terrible judge of my own work. Nearly all of my stories are drafted one of two ways: 1) All the ideas come together in my head and the words flow out onto the page, or 2) I know I’m supposed to be writing, so I slog through the words even though I don’t feel particularly inspired. I don’t think people can tell, reading my stories, which ones were written lightning quick and which ones were grueling, but I definitely tend to like the stories that came together quickly much better than the ones that made me miserable. Because I’m such a terrible judge of my own work, I usually get feedback from one or two beta readers before I send a story out for submission. A fresh set of eyes will often see things that I can’t—things that were perfectly clear in my head but confusing on the page, or places where the story drags. My betas will also call me out on things that I suspected might not be working in the draft, but that I really hoped no one would notice. 2015 was a huge year for you, with something like twenty new stories published. Do you have any advice for those writers who are working toward their first publication? Find what works for you. Get lots of advice from lots of people, and disregard the things that don’t fit. Try a bunch of things, and see what works. Be patient. Some writers start selling stories right away. For many people (including me) it takes a little more time. 2015 was a great year for me, in terms of publications, but I’ve been writing for about ten years now. My first year I didn’t sell a single story, and my second year I sold two. Join a critique group. One that meets in person, if possible, but online is okay, too. Reading other people’s stories can actually be just as helpful as getting feedback on your own work. I learn a lot from reading stories by writers who are slightly above or below the level I’m currently at. Stronger stories help me see what I should be trying to do, and weaker stories help me recognize things I’m doing wrong. What else do we have to look forward to from you this year? My debut short story collection, Seven Wonders of a Once and Future World & Other Stories, is coming out with Fairwood Press in August. I also have stories forthcoming in Daily Science Fiction and Fireside Magazine. 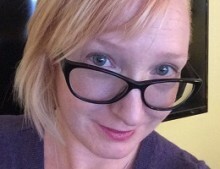 Christie Yant is a science fiction and fantasy writer, Associate Publisher for Lightspeed and Nightmare, and guest editor of Lightspeed’s Women Destroy Science Fiction special issue. Her fiction has appeared in anthologies and magazines including Year’s Best Science Fiction & Fantasy 2011 (Horton), Armored, Analog Science Fiction & Fact, Beneath Ceaseless Skies, io9, Wired.com, and China’s Science Fiction World. Her work has received honorable mentions in Year’s Best Science Fiction (Dozois) and Best Horror of the Year (Datlow), and has been long-listed for StorySouth’s Million Writers Award. She lives on the central coast of California with two writers, an editor, and assorted four-legged nuisances. Follow her on Twitter @christieyant.